↱ Gaming phones have been making headlines a lot as of late. And ZTE’s sub-brand, Nubia has today joined the bandwagon as well. 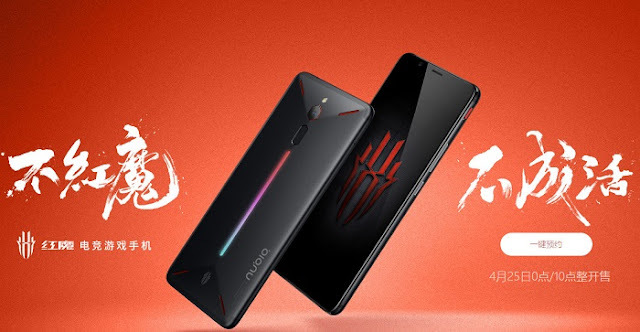 The new Nubia Red Magic’s most distinctive feature, however, is not the power it packs but a customizable LED strip on the rear. ↳ The phone lives up to its gaming title in looks as well. It features an angular aluminum design with tapered edges which the company says is inspired by real hypercars. The Black Shark, the Red Magic also has a dedicated hardware key for enabling a high-performance mode. The rear, in addition to the fingerprint sensor, also houses a 24-megapixel f/1.7 snapper. For selfies, you have a f/2.0 8-megapixel lens.